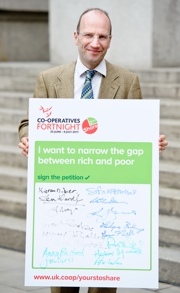 The co-operative movement is today launching a new ethical campaign with a mass petition on equality. The Daily Mirror added it’s voice to our launch, along with over 25 prominent organisations that are supporting the petition, including Friends of the Earth, National Union of Students, Mother’s Union, Groundwork, National Council for Voluntary Organisations, the National Childbirth Trust and the Equality Trust. Please sign the petition – it takes only a moment – and I’d ask you please to forward the petition to friends, colleagues and family. Inequality is at the highest level in the UK since records began – and that is in a global context too where we are slipping behind on development targets. It is time to share.